We’ve compiled a list of the most often asked questions regarding to Fungix™ below. This will not only help clarify any concerns you may have about the usage instructions and benefits, but also assist you in making a choice to start relieving your nail fungus today. Q. 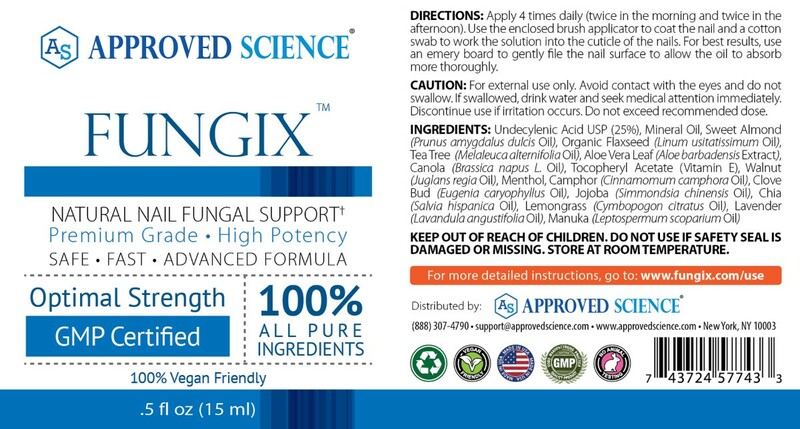 What Makes Fungix™ The Highest Rated Relief For Nail Fungus Today? A: Fungix™ uses a scientifically proven set of powerful dual-action response triggers, using only natural ingredients, to relieve uncomfortable symptoms and quickly clear out persistent infections. This high-quality balanced formula may reduce the foul smell and pain and improve the appearance of the nail. Q. How Do I Apply Fungix™? A: Using the applicator brush, apply Fungix™ to the infected nails two to three times a day. Leave the product to dry and be absorbed for at least 30 minutes before covering the nail. This should ideally be done after a bath or shower, before putting on shoes and socks, and before going to bed at night. It is important to roughen up the nail at least once a week using an emery board. This will help the nail to absorb the product better, improving healing. Make sure to never use the same nail file and clippers on healthy nails. To help stop the spread of the fungus to your healthy nails, protect them with the cuticle cream and nail protein. These can also be used on unhealthy nails once the infection has cleared up. This should help prevent against the nail fungus developing again. Q. Where Does Fungix™ Come From? A: Formulated with highly effective, natural and balanced ingredients, Fungix™ uses a scientific formula that may support in relieving your nail fungus suffering. Fungix™ works to combat infection from the inside out, leveraging the powerful combination of all natural fungi fighting ingredients. Q. How Can I Be Sure Fungix™ is Safe? A: Fungix™ is manufactured in a cGMP Certified laboratory in the USA. Moreover, Fungix™ is constantly tested to ensure it's safe to use. The product is a 100% all natural with no additives, preservatives, or artificial ingredients. Q. Who Should Not Take Fungix™? A: Patients who are nursing, pregnant, who are taking other medications, or with previous health conditions, should consult a doctor or physician first before using any supplements including Fungix™. Q. Where Else Can I Purchase Fungix™? A: Fungix™ can be purchased directly from our website, as well as on Amazon. By supporting the entire supply chain we can guarantee you maximum efficacy in every bottle. Fungix™ is formulated to eliminate fungal infections - fast! If for any reason you are dissatisfied with the product, simply return all the bottles you ordered (both used and unused) within 60 days, for a full refund (​excluding shipping), no questions asked!